Talk about a crazy Halloween this year! So many fun things to do and see and we covered it all just about! Today the kids had a half a day at school so Zoey went home with a friend until I got off of work and then we headed over to Peace Lutheran Church for some Trunk-or-Treating fun. They always have great games set up for the kids, and this year was no exception. Zoey loves getting to go to Trunk-or-Treat so much! It's something that I don't think she will soon outgrow. For those that may not know what trunk-or-treating is, it's where you line up a whole bunch of vehicles with decorated trunks and instead of going from house to house to trick-or-treat you can let your kids go from car to car to trunk-or-treat! It's great! At Peace they have half of the lot partitioned off so that the kids can just run and play and not worry about traffic or strangers...there are old fashioned games, face painting, pumpkin decorating and a bouncy house as well as fresh baked goods and treats. 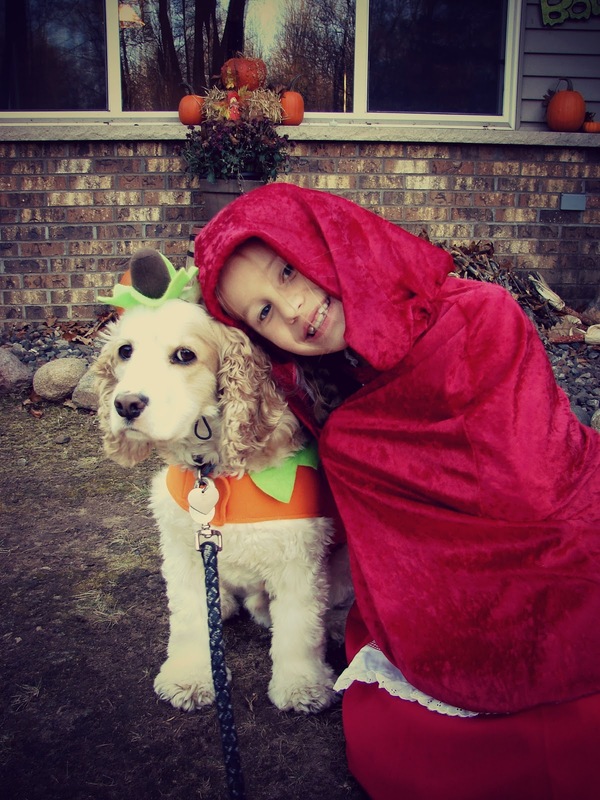 Here is a picture of Zoey and Leo...Leo is thrilled to be dressed up as a pumpkin again this year. You can tell right? Had to get a picture of Zoey sorting all her candy of course, one of the first things she does after coming home from trick-or-treating! Last night I thought it would be a good idea to make up some whoopie pies...all while I was helping Zoey with carving pumpkins, cooking dinner and trying to shoo the neighbor dog away from our house. Not the best timing but they turned out yummy. Zoey did some last minute decorating for trick-or-treater's that we have gotten this evening, though we didn't get even one! While there Ethan and Zoey enjoyed some healthy competition. It was a great Halloween! It seems like we did so much in so little time! I can't believe that it's already November tomorrow! My in-laws have season tickets for the Packers and every season Ethan and I try and choose at least one game to attend and the one that we chose this season was this past weekend when the Packers played the Jaguars. It was a good game to go to since it was a winning one for the Pack! It was chilly but sunny...perfect weather for enjoying a football game along with a hot dog and some hot chocolate! One of my favorite things about going is always getting to people watch. There are so many fans that go all out, I love it! I had to take some photos of the cheerleaders for Zoey since they were wearing PINK ribbons in their hair. The halftime show was great as always. They had the Oneida Nation dancers there performing the Healing Dance for breast cancer survivors. It was beautiful and very touching. When they were done performing the dance they released birds that flew around the stadium and then up and out all together. It was quite the site and quite unexpected. It's always so fun to get to go to a game. My first Packer game that I went to was when I was still dating Ethan, crazy thinking that I've been to several now and get to look forward to it every year thanks to his parents.